"Oh Mama, think of it! I shall be queen! I shall be queen of France!" It's been more than 200 years since Marie Antoinette's celebrated head was severed by a guillotine's blade, but the frivolous French ruler whose lavish lifestyle in the face of famine and poverty helped spur her resentful subjects to revolution is enjoying a bit of a renaissance these days, thanks in large part to Sofia Coppola's contemporary take on her life and times. A fascinating yet divisive figure, Marie has been pitied, berated, dismissed, and admired�often all at once�and consequently, it's difficult to grasp the real woman. Yet her complex persona and colorful existence during a tumultuous period make her a compelling film subject, and back in 1938, MGM spared no expense to bring her story to the screen. And who better to play the doomed monarch than the studio's own resident queen, Norma Shearer, who earned a well-deserved Best Actress Oscar nomination for her regal portrayal. Part of Warner Home Video's Motion Picture Masterpieces Collection, Marie Antoinette lives up to the lofty billing, as it whisks us back in time to both 18th-century France and the magical world of the Hollywood Dream Factory. Few, if any, films of the period can eclipse this jaw-droppingly opulent production (one of the most expensive and meticulously designed of its day), which only occasionally allows its mammoth spectacle to dwarf its drama. Beginning with the 14-year-old Marie's betrothal to the future Louis XVI (Robert Morley in his Oscar-nominated film debut), Marie Antoinette covers a broad historical canvas, chronicling the couple's strained early years, the immature dauphine's difficult adjustment to Versailles' stifling atmosphere, Marie's ceaseless pursuit of pleasure, her manipulation by the Duke d'Orl�ans (played with sinister glee by an oily Joseph Schildkraut), her rivalry with Madame DuBarry (a haughty Gladys George), and brief but passionate relationship with the dashing Swedish count, Axel de Fersen (stiffly portrayed by pretty-boy Tyrone Power). And that's all before the intermission! The film's second half focuses on the notorious "affair of the necklace" (which turned an already contemptuous public forever against Marie), the encroaching revolution, and the royals' wrenching imprisonment. Everyone knows how the story ends, but director W.S. Van Dyke II maintains suspense and provides such intimate access to the queen and her family, we find ourselves forgiving her faults and holding out faint hope that somehow Marie will escape her grisly fate. Hollywood is famous for taking audacious liberties with history, but Marie Antoinette remains largely faithful to the facts. The literate, if talky, screenplay hits all the highlights and low points of Marie's life, and depicts them in a straightforward, non-judgmental manner. Yes, the script strives to engender sympathy for the misunderstood queen (and prove she was wrongly vilified by the French people), but it never shrinks from shining a beacon on her many flaws. At times selfish, imperious, and ignorant, Marie is a reflection of her upbringing and circumstances, and this full-bodied, warts-and-all portrait allows her to gradually evolve from a giddy, empty-headed adolescent to a disillusioned party girl to a mature woman willing to accept responsibility for her actions and mistakes. It also paints her as a loving mother and devoted wife, and it's touching to watch her fondness and sympathy for Louis intensify as the situation in France deteriorates. The resplendent sets and costumes so immerse us in the sumptuous atmosphere of the royal court, it's difficult to fathom the film wasn't shot on location. Art director Cedric Gibbons scrupulously recreates the palace of Versailles, and Adrian outdoes himself with a collection of eye-popping period gowns that must be seen to be believed. During his career, yeoman director Van Dyke was known more for alacrity than artistry�resulting in the nickname "One-Take Woody"�but he handles this ambitious assignment with aplomb, embracing its grand design and creatively using the camera. (A lengthy tracking shot that closes the movie's first half is especially impressive.) His economical style also keeps the film from becoming ponderous, despite its hefty 157-minute running time. Riveting performances help, too. As the bumbling, tongue-tied Louis (who would rather have been a locksmith than a king), Morley files a magnificent portrayal, adopting a quiet dignity in his final scenes that's both admirable and poignant. Schildkraut is equally good and utterly despicable as the scheming, sycophantic Orl�ans, while John Barrymore, in his last important role, makes an appropriately dour Louis XV, who smugly utters the prophetic line, "After me, the deluge." Though ravaged by the effects of alcoholism (watch how his eyes slip around the set in search of cue cards), Barrymore remains a feisty, magnetic screen presence, and dominates his few brief scenes. Conversely, the youthful Power fails to bust out of his matin�e idol mold, and meekly drowns in his leading lady's aura. And what an all-encompassing aura it is. Despite the excellent work of its supporting cast, Marie Antoinette is all about Norma Shearer, and like a hungry tigress, she sinks her teeth into the role, feasting on Marie's foibles and foolishness, as well as the honor and strength that would define the queen's brave last years. Perhaps her toughest task is impersonating Marie as an impressionable teen (Shearer was 35 during shooting), but she manages to pull it off, and the comparison Van Dyke draws between that carefree girl and the haggard woman facing the guillotine two decades later is quite arresting. Though almost forgotten today, Shearer garnered considerable respect and admiration�all of it warranted�during her prime. It's true, she received many plum roles as a byproduct of her marriage to MGM production chief Irving Thalberg, but Shearer was a fine actress in her own right, and Marie Antoinette�her first film following Thalberg's untimely death at age 37�is the crowning achievement of her career. Whether or not her personal grief adds depth and texture to her work remains open to debate, but Shearer's perfectly pitched emotional responses seem less mechanical than in previous pictures. A few affectations creep into her performance, but for the most part, she etches an ebullient, moving, and altogether memorable portrayal. Just as Marie herself now enjoys a wave of resurgent interest, one can only hope the DVD release of Marie Antoinette does the same for Shearer. After all these years, both women deserve it. Image Transfer Review: A royal film requires a royal transfer, and Warner treats Marie Antoinette with the care this "motion picture masterpiece" deserves. As smooth as the silk gowns worn by the women of Versailles, the superb image quality is marked by deep blacks, a wide-ranging gray scale, and excellent clarity and contrast. As a result, the sets and costumes leap off the screen, and we can fully appreciate the impeccable artistry that drips from the film's every frame. Print defects are kept to a bare minimum, and just enough grain preserves the celluloid feel. Classic movie fans will be thrilled with this presentation, one of Warner's best recent efforts. Audio Transfer Review: Warner has fashioned a Dolby stereo track that showcases the film's epic elements and helps to further immerse us in the period atmosphere. Though any separation is difficult to detect, the audio is rich, clean, and always clear, with no distortion or annoying surface noise cluttering the track. The revolutionary scenes sound appropriately robust, and Herbert Stothart's Oscar-nominated score nicely envelops without overwhelming the action. Purists will be pleased to learn this edition of Marie Antoinette restores the film's original overture, entr'acte, and exit music, all of which feature excellent fidelity. Extras Review: Two very entertaining vintage shorts dress up the disc, beginning with Hollywood Goes to Town, a nine-minute one-reeler that delineates how Hollywood craftsmen transform the exterior of a typical movie theater into the gardens of Versailles for the Marie Antoinette premiere. Though the music track for this featurette has been lost, the narration remains, and it details all the elements necessary for a glamorous and streamlined movie opening. Star-gazers will especially enjoy seeing Hollywood's brightest�including Judy Garland, John Barrymore, Norma Shearer, Tyrone Power, Spencer Tracy, Robert Young, James Stewart, Jeanette MacDonald, Merle Oberon, Charles Boyer, Jack Benny, Claudette Colbert, Robert Montgomery, Clark Gable, Carole Lombard, Robert Taylor, and Barbara Stanwyck�parading into the theater. We're also treated to a rare snippet of Fanny Brice performing her classic Baby Snooks routine. Another Romance of Celluloid, which runs 11 minutes, provides a fascinating glimpse of how film is developed and processed, along with some rare behind-the-scenes footage from the Marie Antoinette set. Rare clips of a Luise Rainer costume test and Freddie Bartholomew rehearsing with live elephants for his forthcoming Lord Jeff are also included, as well as promos for future MGM productions, such as Test Pilot, Too Hot to Handle, The Great Waltz, Sweethearts, Three Comrades, Northwest Passage, and one that never got made�an adaptation of William Faulkner's The Unvanquished. 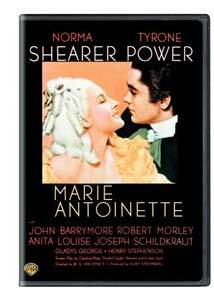 The original theatrical trailer for Marie Antoinette completes the supplements. A fitting tribute to a complex queen, Marie Antoinette is grand entertainment on the grandest of all scales�and it's pretty good history, too. No other studio but MGM could pull off such an extravagant spectacle, and few other actresses could explore Marie's many facets as well as the underrated Norma Shearer, who gives an often mesmerizing, career-defining performance. Warner's beautiful transfer honors the film's glorious sets and costumes, and tops off this essential Golden Age disc. Highly recommended.